3 year warranty. If it's the same sort of quality as the other Parkside tools I've bought then this is a steal! Anyone have any experience with something like this? Good enough for DIY? I have a nice combi drill, but a sander, saw and oscillating tool would be nice to have. Or would I be better off spending the money on a proper corded oscillating multitool? These sorts of kits are only really good for occasional DIY. If that's you, then go for it. I think two batteries would be needed though. extra batteries can be had for around £15 from grizzly tools I believe. Great for occasional DIY, remember the Black & Decker Quatro ? Puzzles me though why they have made it 14.4 volt instead of 18 volt to match their drill, jigsaw and chop saw that they marketed a few months ago with interchangeable batteries. There will probably be a bit of a. comprise with the handle in terms of comfort compared to dedicated tools but looks good for occasional DIY use. 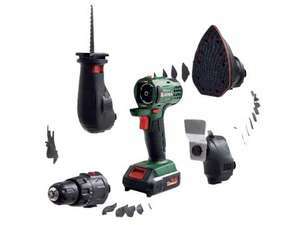 Great for occasional DIY, remember the Black & Decker Quatro ? Puzzles me … Great for occasional DIY, remember the Black & Decker Quatro ? Puzzles me though why they have made it 14.4 volt instead of 18 volt to match their drill, jigsaw and chop saw that they marketed a few months ago with interchangeable batteries. I remember the quatro. Pile of rubbish. A few people reported problems with the batteries on the 18v impact driver. If you do buy one, give it a thorough work out to ensure you do not have a dud. How do you claim against warranty if things go wrong? Do I have to keep the box (packaging) and receipt for 3 years? Anyone have any experience with something like this? Good enough for DIY? … Anyone have any experience with something like this? Good enough for DIY? I have a nice combi drill, but a sander, saw and oscillating tool would be nice to have. Or would I be better off spending the money on a proper corded oscillating multitool? Aldi do a mains oscillating tool I bought one on a reduced price for £17 comes in a case with some attachments they also do packs of attachments 3-4 in a pack £6/7 a pack. I am not knocking Parkside brand I have a Parkside orbital sander and it is better then the Bosch one I had. [quote=CannedChaos]Aldi do a mains oscillating tool I bought one on a … [quote=CannedChaos]Aldi do a mains oscillating tool I bought one on a reduced price for £17 comes in a case with some attachments they also do packs of attachments 3-4 in a pack £6/7 a pack. I am not knocking Parkside brand I have a Parkside orbital sander and it is better then the Bosch one I had. It so happened that I had a bit of work I needed to get done before this deal started and got an Aldi workzone cordless oscillating tool for £30. Not the most powerful thing in the world but light and manoeuvrable, fantastic for small jobs. I think I'll be on the lookout for a good deal on a high quality mains-powered oscillating tool because they are bloody fantastic. I have the black and decker Evo multi. Which is like this ... Tbh I use it every day and for the past two years . It's excellent I use it for trade use and I fit gutters and fascias and soffits and never run into issues . Just bought this and the kit contains additional drill bits, sanding paper and the saws and comes in a neat little box. Pretty good machine for DIY'ers. Hot, bought...How do you claim against warranty if things go wrong? Do I … Hot, bought...How do you claim against warranty if things go wrong? Do I have to keep the box (packaging) and receipt for 3 years? Warranty contact info will be on the box or instructions. No, you don't need to keep the packaging. Warranty contact info will be on the box or instructions. No, you don't … Warranty contact info will be on the box or instructions. No, you don't need to keep the packaging.